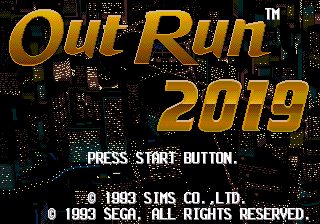 OutRun 2019 (アウトラン 2019) is an entry in the OutRun series, released in 1993. It is a Mega Drive exclusive title, and takes place in the "futuristic" year of 2019, unlike previous OutRun titles which take place in the present day. OutRun 2019 shares similar gameplay to the original OutRun, with a boosting mechanic similar to Turbo OutRun; beyond this, it uses a futuristic setting and offers various additions such as jumps, bridges, and tunnels. Notable changes between different releases of the game include the maximum speed of the car. In the Japanese game the maximum speed is 341 km/h (211.89 mph), 682 km/h (423.77 mph) in the European version and 682 mph (1097.57 km/h) on the US version of the game. OutRun 2019 was initially just an OutRun-like game for the Mega-CD under the working title of Cyber Road. It was soon moved to the Mega Drive and renamed Junker's High (also known as Junker Spy), until SIMS were granted the rights to use the OutRun brand. The change of name came quite late - advertising for Junker's High was already being printed in Japan prior to the switch. A near-final prototype ROM of Junker's High has since leaked on the internet, showing that Hertz/SIMS had planned on including save memory in the game to store replays and high scores over time. Saving was removed in the final version of OutRun 2019, perhaps for budgeting purposes. Radica Games re-released the game as part of the Play TV Legends series in 2005. This version is notable for its steering wheel controller. Printed by: Sega Enterprises, Ltd.
Main article: OutRun 2019/Magazine articles.